On a warm late-spring or summer day, there's often only one thing that will please everyone: playing in the water. And that's what free spray parks are all about. And bonus: They tend to be open for more days of the week and for longer hours than many public parks' wading pools. 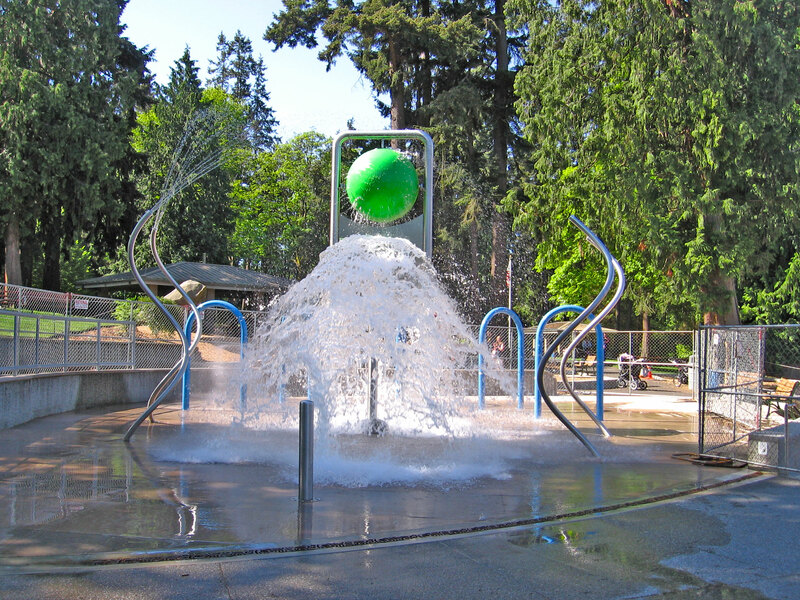 At this centrally located park (right next to a skate park and kitty-corner from the Ballard Public Library), kids can run through water jets set into the pavement (toddler-friendly), play on the lawn or scooter on the paths. There is an awesome candy and ice cream store at the edge of the park (Sweet Mickey's), and Ballard's many fun eateries are steps away (try new Katsu Burger, opening this summer). Hours: Open daily from 11 a.m.–8 p.m., May 26–Sept. 3. Just off I-5 in North Seattle, this shady park is a big draw, and for good reason. Beyond the newish spray park, it boats a fantastic two-part playground (for toddlers and older kids), hiking trails, a great hill to roll down and more. Only drawback: The parking lot can fill on hot days, though street parking is fairly easy to find. Hours: Open daily 11 a.m.–8 p.m., May 26–Sept. 3. 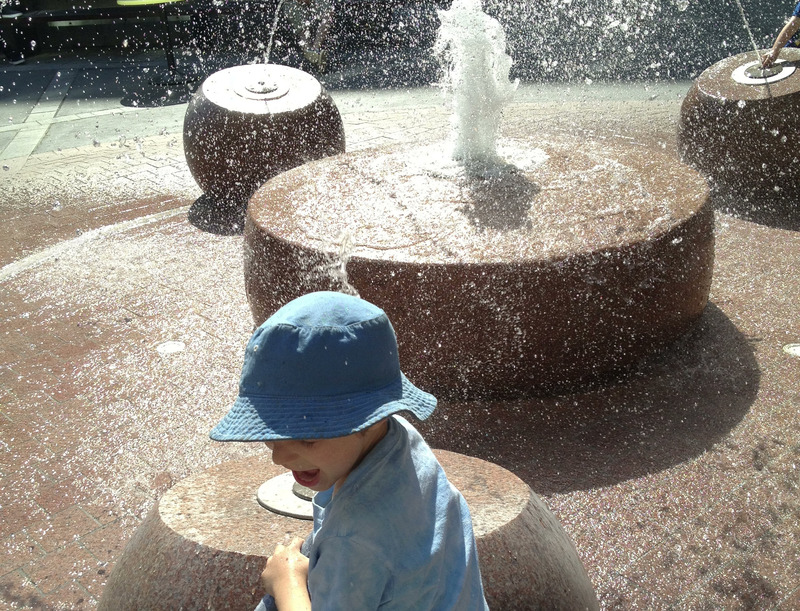 Find a small but wonderful fountain on the Thornton Place plaza in northeast Seattle (just south of Northgate Mall). Order bubble tea or a crepe from Jewel Box Cafe and set up at a table with an umbrella; you can read or work while the kids play. There's also a giant chess board on the plaza, more eateries including a ramen spot and a conveyor-belt sushi restaurant and a Regal Cinema. 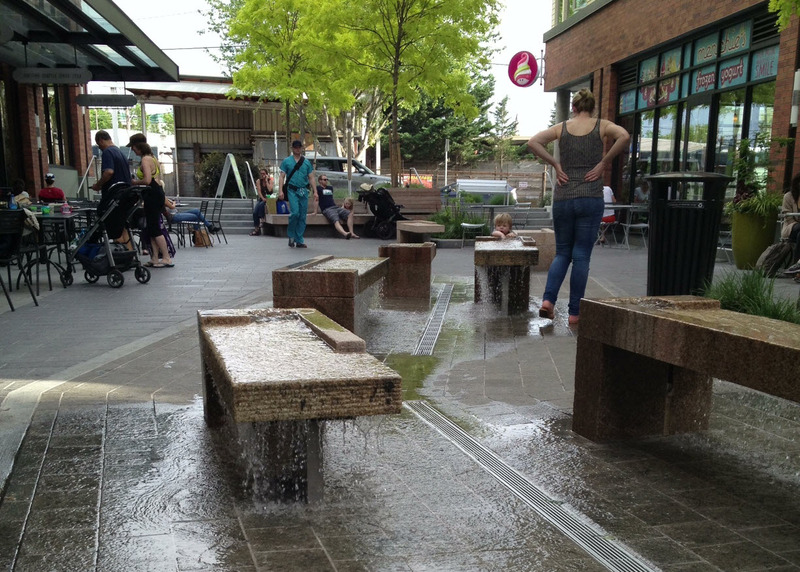 The water feature on the plaza outside the PCC Community Market at Green Lake Village — benches with water cascading over them — is beloved by parents and kids alike, and it's toddler-friendly as well. Pick up a snack at PCC, Menchie's Frozen Yogurt or Kitanda Espresso and Acai (gluten-free cheese bread sandwiches! ), sit at an outdoor table and let the kids play. Green Lake is two blocks away. Tip: Free 1.5-hour parking in PCC's underground parking garage with a PCC purchase. Hours: Open seasonally on warm days. 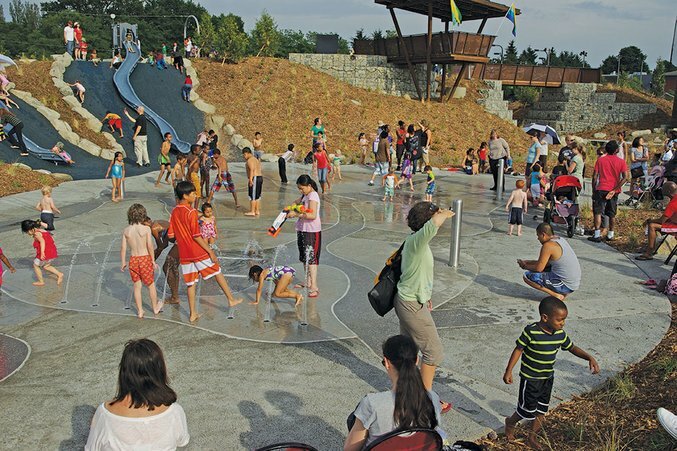 The state-of-the-art water feature at Jefferson Park is part of Beacon Mountain, an ecologically oriented playscape. Kids will also love the steep and deep tube slides and biking paths; parents will love the view of the Sound and the Olympics from the park. 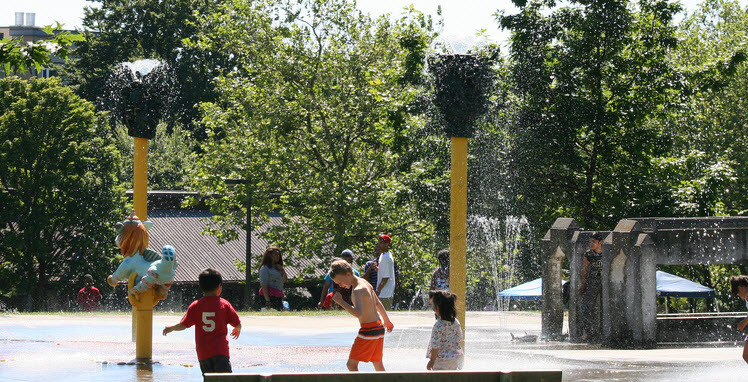 Head to Rainier Valley for playtime at this unusually shaped spray park (tall, Flintstone-like towers spraying water) in the lower area of Judkins Park, near the children's play area. The park also has picnicking spots, trails, a skate spot and a multi-use sports area. Combine with a visit to Northwest African American Museum (NAAM), a half-mile away, or with playtime at the wonderful all-abilities park, Seattle Children's Playgarden. Located on the east side of Capitol Hill, Miller Park's spray area (the Ron K. Bills Fountain) features granite blocks that mark off the points of the compass and a small circular play space. There are also sports fields, and a community center with basketball court and game room. Note: Pratt Park spray park is closed for renovations for the summer of 2018. With an apartment complex located adjacent to Pratt Park, the park is busy, especially in the summer months. Beyond the spray area, find a playground, basketball court and picnic tables. Pratt Fine Arts Center is located next to the park, and the Langston Hughes Performing Arts Center is a short walk away. Tip: Broadcast Coffee Roasters is at the northeast corner of the park. Located in the heart of this artsy-industrial neighborhood, Georgetown Playfield boasts a fantastic new playground, lots of big shade trees, and a spray park with many kinds of spray features. Also find a half basketball court and artificial turf soccer field. Tip: Stellar Pizza is just north of the park. Long called the 37th Avenue Park, John C. Little, Sr. went through an upgrade and renaming in recent years. Beyond the spray feature, it also has a playground, picnic shelters and even a community garden. It's also just a short walk from the Ohtello light rail station. 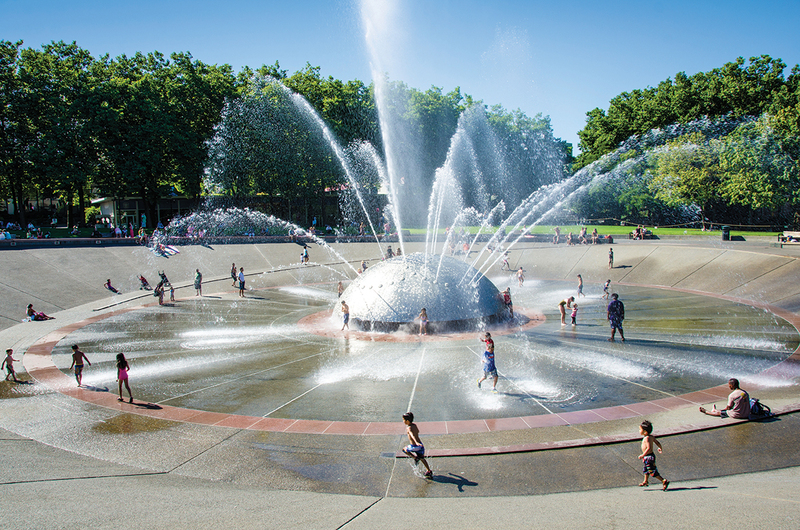 The big Kahuna of spray parks is Seattle Center's famous International Fountain, open year-round, and — on hot days and during festivals — crawls with kids who stand and run (usually screaming) under the fountain’s powerful water jets. You can hang out on the sidelines and enjoy the show, including music that the jets are seemingly choreographed to match. Tip: Younger and more timid kids might prefer the Dupen Fountain (aka Fountain of Creation), with its bronze sculptures and wading-pool-like feel. Find it near Key Arena. Hours: Open daily from 11 a.m.–8 p.m. The series of fountains at Lake Union Park is just one of the draws at this awesome public space. Kids can also explore boat-building at the Center for Wooden Boats (or rent a boat, free rides on Sunday), visit MOHAI (free for kids ages 14 and under, and always free on first Thursdays), or hop on the Seattle Streetcar for downtown destinations. Kids love the bucket dump at this spraypad located in this smallish park in West Seattle. There's also a new playground, upgraded sports fields new picnic tables and benches. The park is situated in a residential area with lots of big, shady trees. After you get done splashing in the fountain, the park is also an ideal spot for a picnic, and features gorgeous views of Mount Rainier. Tip: Family-friendly Elliott Bay Brewing is across the street from the park; and a farmers market sets up at the park every Thursday from mid-May to mid-October, 11 a.m.–6 p.m. Hours: Open May to October. Opened in 2016, this large spray park has already become a North Sound favorite. 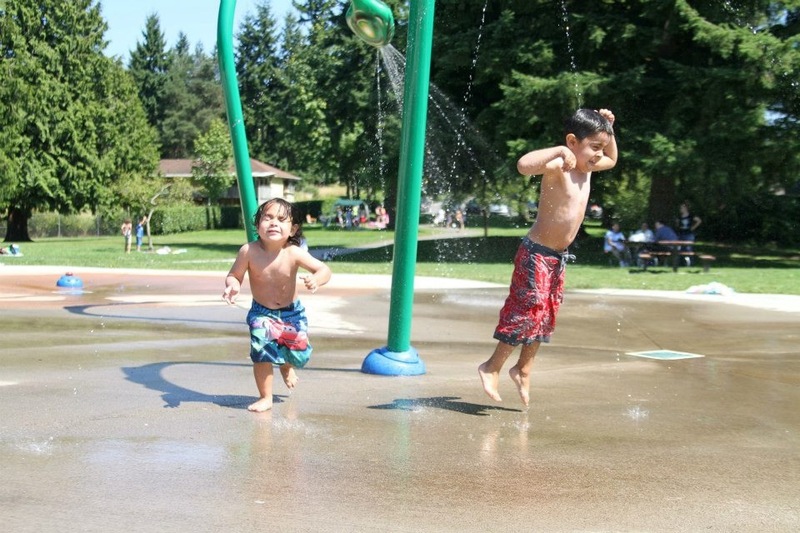 Located at woodsy Edmonds City Park next to a play structure (also new), it includes a 55-gallon bucket, water cannons, arches that spray water and a toddler-friendly area where kids can play in water. Look for the fun area beyond the spray park where kids can build small dams to affect water flow. Conveniently, picnic tables are located nearby. The park also boasts a ballfield, trails and more. It's also a nice stroll to the ferry terminal. This newer spray park features water jets, spray cannons, rotating sprinklers and more fun for the kids. there are restrooms equipped for swimsuit changes, and on Tuesdays from 10–11 a.m. there is a spray park session for kids with special needs. 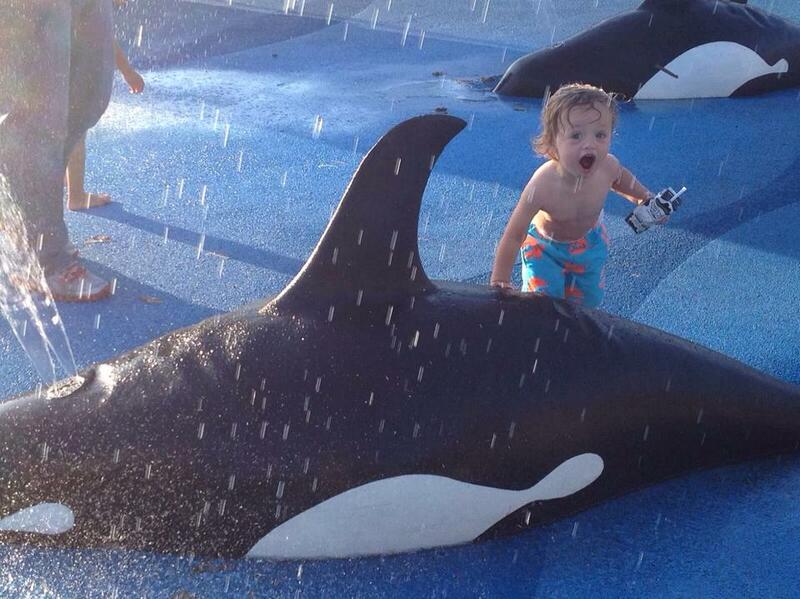 It's worth the drive to play in the giant spray pad at Snohomish's wonderful Willis Tucker Park. Watch out for the dragon soaker! Reader Sandra Lamb recommends exploring the "awesome playground and sand pit area," too, and says it has soft grass for picnics or to to run around and play on." Tip: On Thursday evenings in July and August, there is a family-friendly outdoor movie series, starting at 7 p.m.
Everett's Forest Park boasts an awesome water playground with 16 interactive water features and an area designed just for toddlers. You could plan an entire day trip: Forest Park also offers a playground, a free petting zoo (opening June 23) and even a swimming pool. Besides the nice spray park, this park in Lynnwood also features nature trails and picnic areas. Hours: Open 11 a.m.–7 p.m., June through Labor Day. The big draw at this older spray park is the large, mist-spraying green dragon. It's open June through Labor Day. Located in one of the Eastside's most culturally diverse neighborhoods, this park is absolutely worth the drive. Beyond the super-appealing Northwest-themed spray park (a climbable orca, spitting frogs and clams), find a playground, walking trails, covered picnic shelters and even a nine-hole golf course. Crossroads Bellevue shopping center, with ethnic eateries, 25-cent rides for kids and free entertainment on the MarketStage, is a short walk away. Hours: Open 11 a.m.–7 p.m., May 25 through Labor Day. One of the Eastside's most popular parks, Grass Lawn has extensive fields, kid-friendly biking trails, picnic areas, great playgrounds for little and big kids (including a two-story climbing structure), and a sensory-activated spray pad. Tip: Find more to do in Redmond in our neighborhood guide. 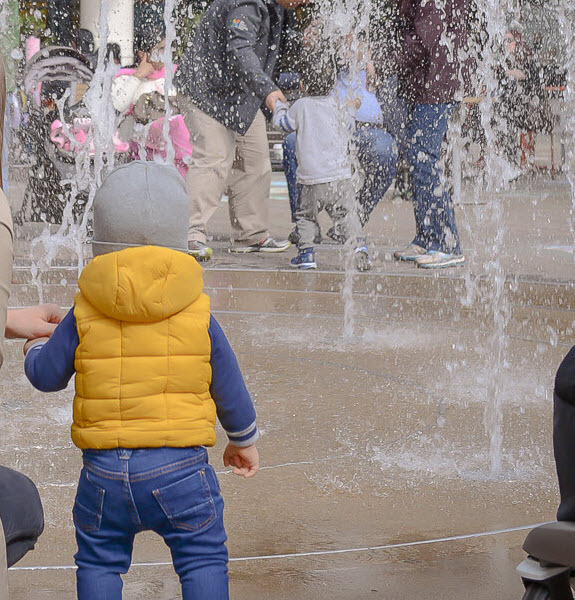 Redmond Town Center's outdoor areas went through a recent upgrade to make them more play-friendly and safe, with a pedestrian zone that encompasses the splash pad, as well as pavement games and picnic benches. Tip: Find more to do at Redmond Town Center and beyond in our neighborhood guide. Hours: Open on sunny days; specific hours unconfirmed for 2018. Next time you're on the Plateau, give this park a try. Located in the Lower Commons park, the button-operated spray park is next to a play structure, so your kids can choose between wear-'em-out options. Note: If you park in the city hall lot, it's a bit of a hike. 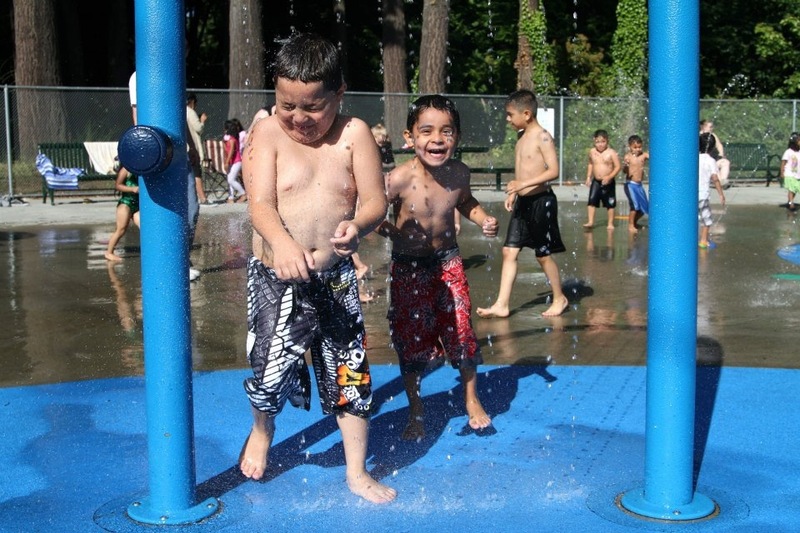 Readers alerted us to this splash and spray park located at Tukwila Community Center, with fish spouts to aim, fountains and car-wash-style play areas. Hours: Open 10 a.m.–8 p.m. daily, May 28–Sept. 2. Hours: Though this sprayground typically opens Memorial Day weekend, its 2018 opening is delayed until June 2 due to construction. Open through Labor Day. The fountain in Kent's Town Square Plaza has an unusual feature, a 13,000-pound granite ball sculpture, which can be rotated in its base. Kids and adults alike enjoy giving it a spin. Hours: Open daily, 10 a.m.–9 p.m., May 21–Oct. 1. 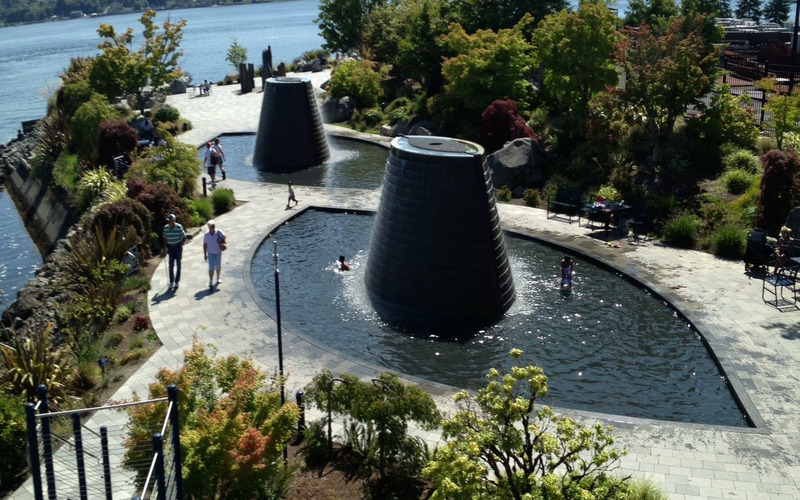 The crazy-cool fountains at Harborside Fountain Park, just down the stairs from Bremerton's ferry terminal, got a serious plumbing makeover in 2016 and are open for business again. Your kids will have hours of fun wading in the series of copper-ringed, volcano-like fountains (when will they explode next?!). Non-wading parents can sit at nearby tables and chairs; however, shade is scarce. Tip: Combine it with a trip the free Puget Sound Navy Museum, two minutes away, or, just a short walk farther on the pier, the USS Turner Joy (guns, engine room, control panels, more). From Seattle, take the one-hour WSDOT car ferry from Seattle; or the new Kitsap Transit pedestrian ferry. Editor's note: This article was originally published in 2014 and updated for 2018.